I have been listening to David’s music since I first heard Between Green and Blue way back in 1996. Every release since that time including the collaborative efforts between him and Jon Jenkins have all been albums that showed the immense talent that David possessed as every composition shined like a brightly polished diamond. This latest release which came out on July 7, 2017 is the first of what I hope will be many volumes of David’s ambient guitar music which takes our perceptions of what can be done with a guitar alone into a whole new realm. A Sea Without Memory consists of 5 tracks with the shortest at 4:11 and the longest at 21:10 but most are over 10 minutes in length. What I love about songs like these is that their length makes them very immersive compositions and allows David to build moods and feelings over an extended period of time so that the listener can be enveloped by his rich and atmospheric soundscapes. The overall feeling that these songs engender is that of tranquility and a peace that comes when a person allows themselves to block out everything that competes for their attention so that they can focus on what is internal rather than what is external. The songs on this album have a calming effect as they gently wash over you leaving the listener suspended in what feels like a dream but more lucid, more aware of how the ebbs and flows relate to who you are as an individual. All the tracks on this album are exceptional pieces of music so saying that any one of them is my favorite track is next to impossible. Besides the album lives and breathes as a single organism so pulling a track of it out and examining it separately from the whole really does not yield an understanding of how the album as a whole flows or how that one track fits into the whole. So I won’t be doing that in this review. Suffice it to say that A Sea Without Memory for me stands as a whole composition not as individual tracks. David’s music does evoke natural images in my mind as I listen to the flow of this album like waves lapping on a beach somewhere or watching the sunrise or the sunset or even like the northern lights as depicted on the cover of this album. Perhaps that was David’s intention or perhaps it is my own inclination to associate some of the music that I enjoy the most with the natural world that surrounds me. The joy of art whether it is musical or visual is that the ultimate judge of what it means is each individual that is exposed to that art and how it makes them feel. 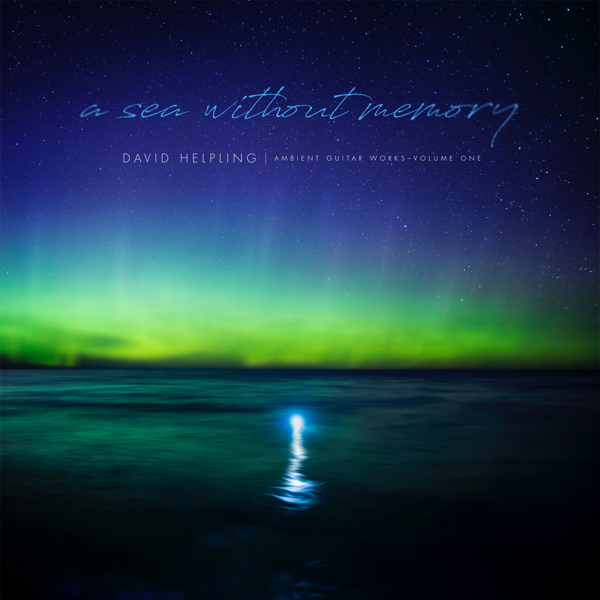 A Sea Without Memory shows forth the talent and the artistry of David Helpling and his dedication to making the best art that he possibly can. His guitar playing is always heartfelt and confident as he allows the music to flow from his inner spirit, into his guitar and then out again to be recorded for the rest of the world to hear and be amazed at. David is a consummate artist when he picks up his guitar and the memorable tracks on this album are simply further proof that he is an innovative musician with an understanding of where he has been and an eye on the future and where he wants his music to go. I find the music on this album to be very thoughtful and very moving and it certainly does not disappoint in regards to what David’s fans hope to find on one of his albums. Ambient Visions highly recommends this album. Enjoy!